Connected Bodies Team tries to retrieval invisible signals from the human body – but is it possible in an opposite way? With what kind of effects, sounds, colors, pictures can influence the feelings, thoughts of a person? What if that person functions as an interface between the outer and the inner world? 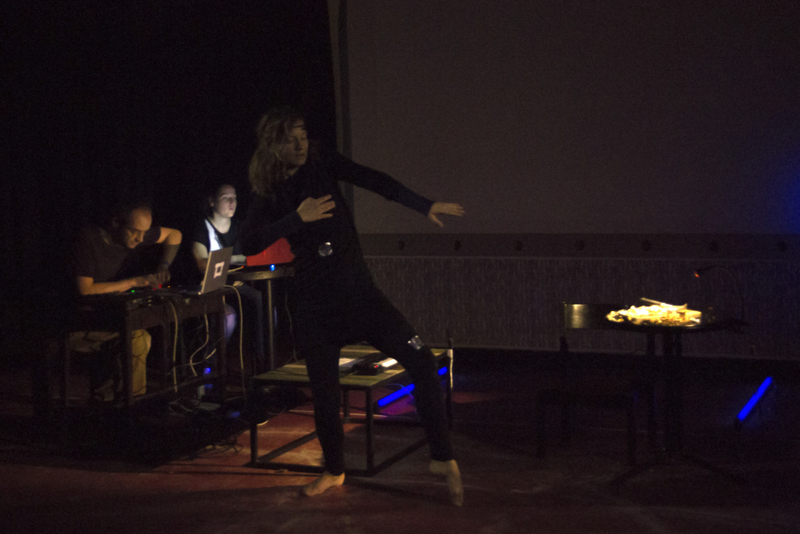 In the CONNECTED FEELINGS performance the dancer’s feelings – through measured brainwave, face expression, sweating, heartbeats – are becoming visible thereby she is at the mercy of the audience. 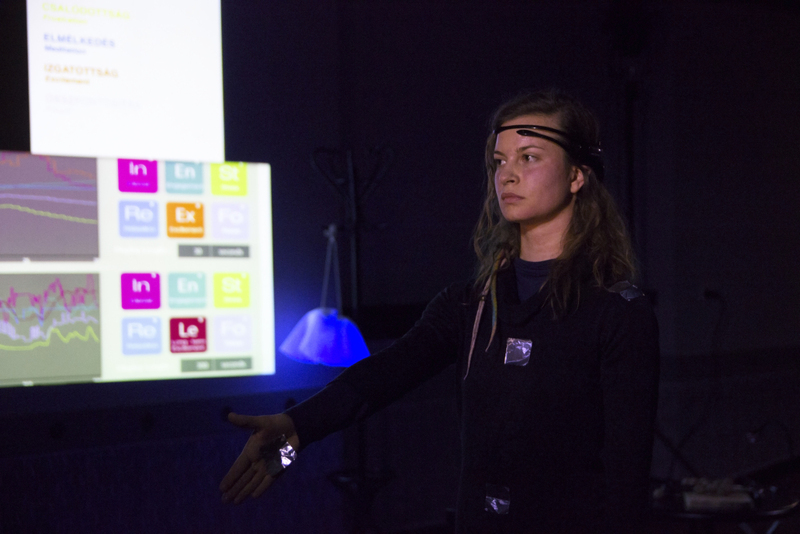 This experiment focuses the contextual behavior, live and intimate interaction, physical contact and manipulation between people. 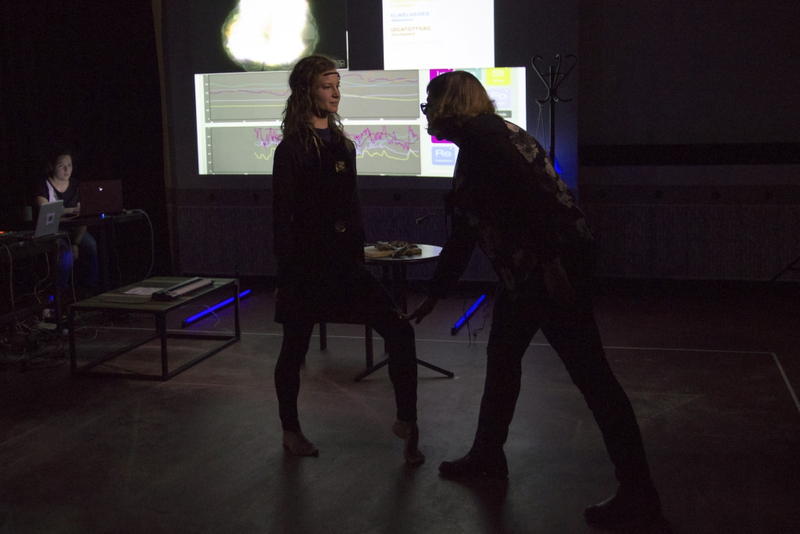 It is provocative because the participants /audience must secede from their usual passive observer state by touching and manipulating the dancer through real physical contact. 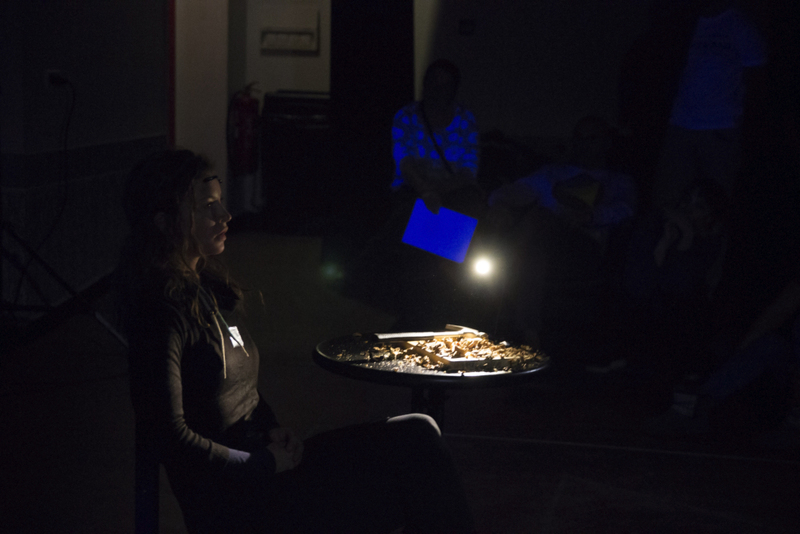 The aim of this performance is to lay emphasis on self-consciousness (which is the awareness that one exists as an individual being) and to give a framework and time to the audience to deal with the question how the human organism functioning. Hopefully, the spectators make real this knowledge later in their life and also improve their communication skills or feel more empathy for each other. By the beginning and the end of the performance details from Offending the Audience and Self-Accusation by Peter Handke are audible. Handke’s play is a downright attack on the way language is used to depersonalize the individual – what contradistinguish between the individual (acting on the stage or observe her/himself at the space) and the mass during the end of the performance. Suddenly the audience becomes aware of their-self because they focus on their reaction in accordance with the quotation. The story contains short scenes what flows insensible into one another: breaking walnut – nonsense verses – animal piano piece – childhood memories – eating walnut/brain – chaos came to be – presence and consciousness. Each ‘scene’ has its own sound design. 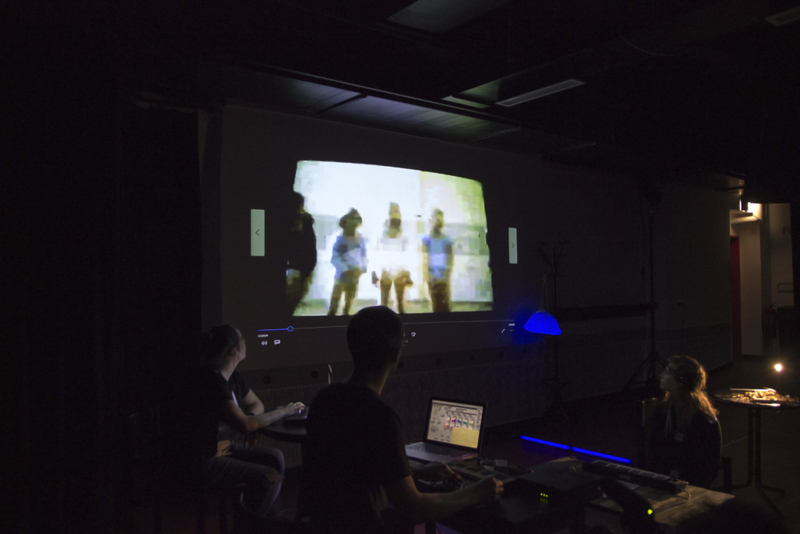 Some parameters of the predesigned compositions are controlled by the changing brainwaves, excluding the ‘chaos’ in which both the dancer and the composer improvise. 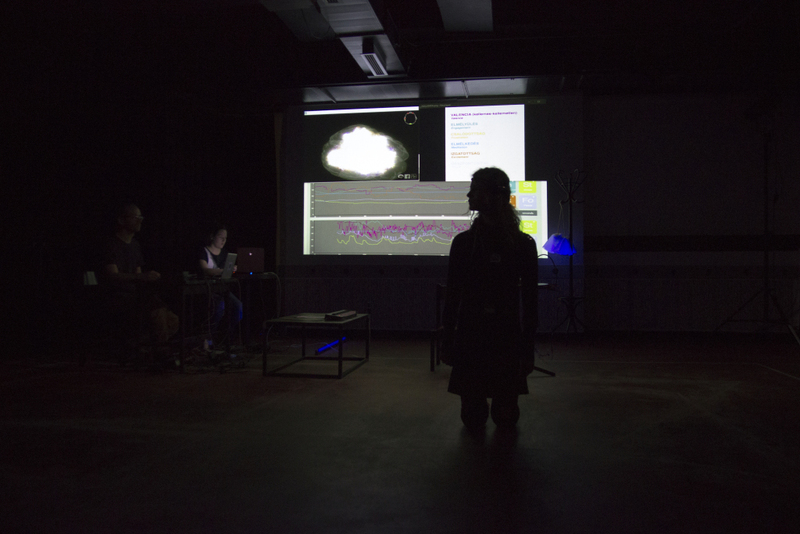 A dancer is wearing a brainwave sensor and the spectators can view her mental effects projected onto a screen during the performance. We are measuring through Insight Brainwave sensor the four basic emotions: Excitement, Engagement/Boredom, Frustration, and Meditation. The output for each emotion is a floating point number between zero and one, we map those data to show percentage between 0-100% according to the current emotional state of the performer. 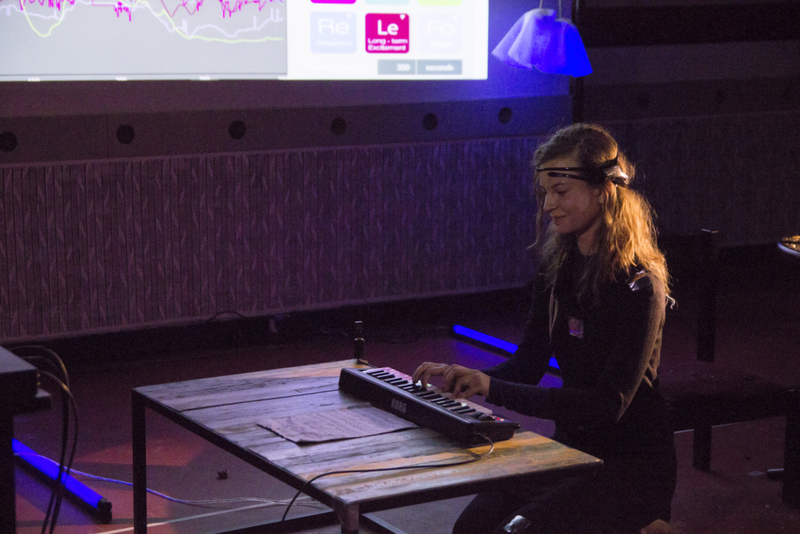 It is possible to communicate with Emotiv Insight via Open Sound Control protocol (OSC) to access and process its data. 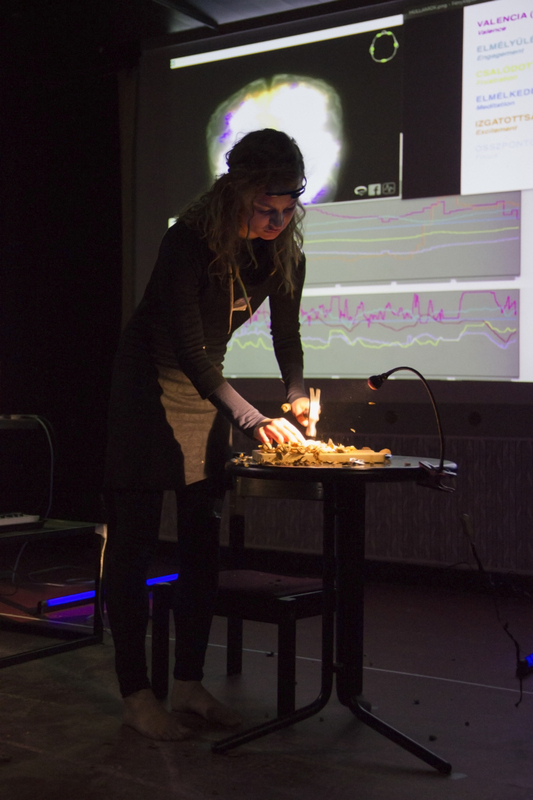 Furthermore, a 3D brain-model appears on the screen that shows the activity of the neurons in real-time. The 3D Brain Visualizer application displays a real-time brain activity in four significant brainwave frequency bands (Delta, Theta, Alpha, Beta). It also allows for seeing detailed information and relative strengths between different brain regions. 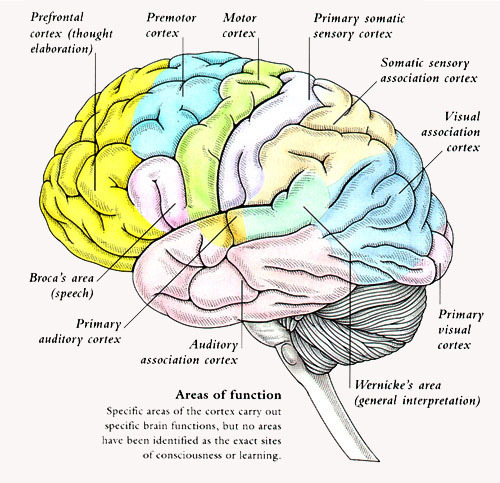 The cerebral cortex is divided into four sections, called “lobes”: the frontal lobe, parietal lobe, occipital lobe, and temporal lobe.